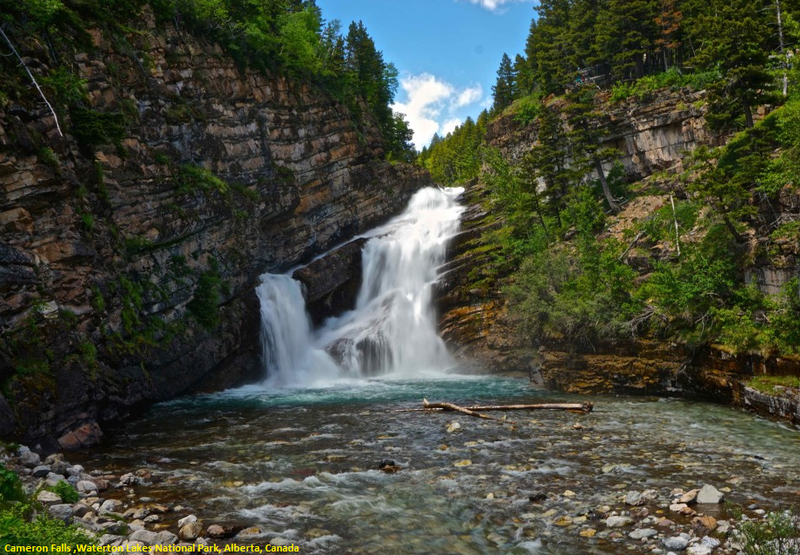 Cameron Falls, located on the west side of Waterton Village, is more an attraction than a hike. Without a doubt it is a photographic gem and consistently draws a large crowd. There are short climbs along and above both sides of the waterfall to several viewpoints. Cameron Falls are marks the beginning or end of the world-class, spectacular Carthew- Alderson hike between Cameron Lake and the Town of Waterton in Waterton Lakes National Park, Alberta, Canada. Cameron Falls is a very uniquely shaped waterfall of about 75 feet in height found in the heart of the Waterton townsite in Waterton Lakes National Park. Cameron Creek falls over a section of bedrock thrust upward at an angle and because its eroded the various layers differently, the water takes several different paths down the rock face, actually crossing over itself in two separate instances, creating a striking double "X" pattern. Travel to the Waterton Townsite in the Waterton Lakes National Park in the southwest corner of the province of Alberta, Canada. From Waterton Avenue (main street) travel up Cameron Falls Drive to Evergreen Avenue and a small parking area for the falls.